Come join us for a fun night of dinner, entertainment, and auction to raise funds that support our schools! 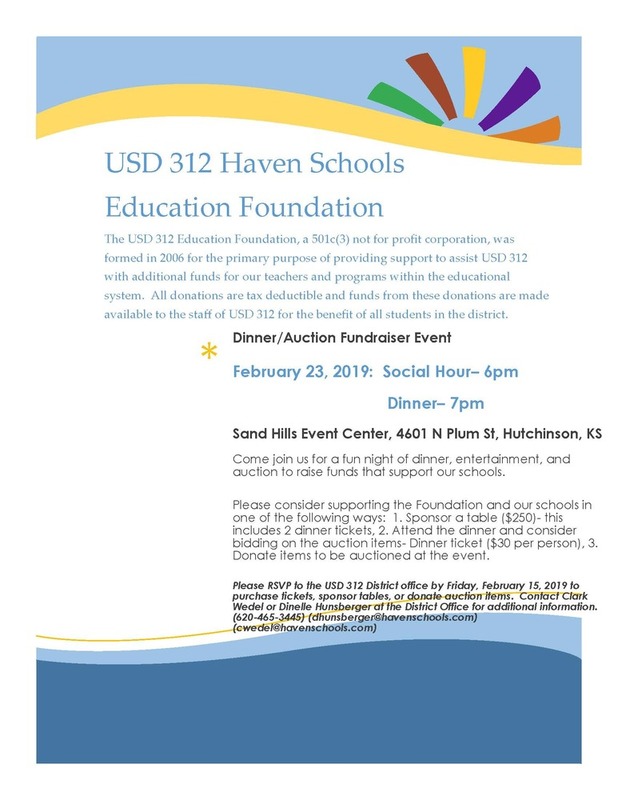 There are a few ways you can help support the Foundation and our schools: 1) Sponsor a table ($250) - this includes 2 dinner tickets, 2) Attend the dinner and consider bidding on the auction items - dinner ticket ($30 per person), 3) Donate items to be auctioned at the event. Please RSVP to the USD 312 District Office by FRIDAY, FEBRUARY 15, 2019 to purchase tickets, sponsor tables, or donate auction items. Contact Clark Wedel (cwedel@havenschools.com) or Dinelle Hunsberger (dhunsberger@havenschools.com) at the District Office for additional information, 620-465-3445.